When I first read this card, I almost missed the part where the token goes to the same player that controls the original creature. You can’t really use it to steal creatures – if you could, it’d probably be a blue card – but it makes for a useful tool in Two-Headed Giant, not to mention a political card in adversarial multiplayer scenarios. I also want to see if there’s a way to use it to force an opponent to have a second copy of a creature with a drawback along the lines of Grinning Demon or Lord of the Pit, though I don’t know if someone’s likely to cast a creature like that when they see an opposing Bramble Sovereign. Bramble Sovereign just screams “build around me”, doesn’t it? It’s clearly made to enable people in multiplayer games, like Two-Headed Giant games and Commander. 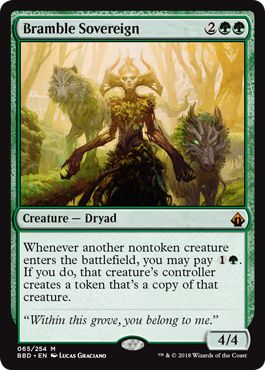 Being able to duplicate any creature for 2 mana is a powerful effect by any measure…especially in green, the color of mana acceleration. The danger, of course, is that Bramble Sovereign needs time to do its thing, as it’s unlikely to have an immediate impact unless you have a surfeit of mana. A 4/4 with no combat abilities and no protection is resolutely mediocre, as well; it’s workable, but there are plenty of ways to take it out before it gets rolling. It’s a powerhouse in casual play and in Limited, but Legacy likely has no place for a slow engine creature that relies on other creatures.